The kayak hooping clinics are usually held on a weekend unless you can get away on one of the less crowded weekdays. The clinics start about an hour and a half before sunset. After a dockside clinic and before sunset we paddle out and discuss the areas that are legal to hoop in the harbor. Just before dark we set our first nets in and around the harbor and we stay out for a few hours or until you get your limit. 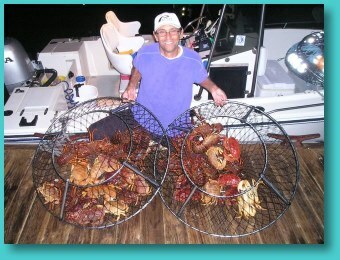 I supply the hoop nets and rigging, bait, lobster gauge, headlamp, and gloves. You bring the luck! 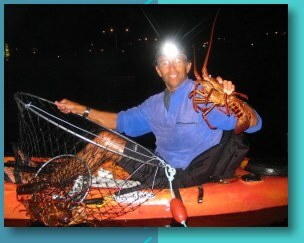 Kayak clinics are by appointment only and are only held if 2 or more clients are scheduled. Private and guided trips are also available and kayaks are available for rent. Please call or email for pricing and to make an appointment. I’ll travel to your local launch ramp or dock and bring 10 nets, and all the gear and bait we’ll need for a fun night of hoop netting. We’ll look at a couple of maps and books for your area then choose our hooping spots. Trips are usually 3 hours or more depending on the hooping and the weather. The private boaters clinics are by appointment only. There is a fuel surcharge for Ventura and Orange county. Trips are weather dependent! it really helps with all the exercise. Please e-mail or phone, your address and fishing license number so that I can speed things up on the day, by filling out my DFG guide forms and a liability waiver ahead of time. From the 405 fwy. Get off at Ingelwood Ave. and go south to 190th St.
At 190th go west (right turn) go to Harbor Drive (190th. turns into Anita St. at Ripley Ave. then becomes Herondo at P.C.H.) Herondo dead ends at Harbor Drive. Go South [left] on Harbor Dr. down past 3 signal lites,( past Beryl St. ) to the first parking lot entrance on your right. You will see Captain Kidds Seafood market and restaurant on your left as you enter the parking lot. Push the button and get a parking ticket which you will later sign and write Hand Launch on the back of it. (The cost for parking is $4 for 8 hrs.) When you enter the parking lot go straight ahead towards the Sportfishing Pier and just past the restaurant Lattitudes you will make a right turn on a small paved road. The launch dock is on your left as you go down this road about 200’. You can unload here then park your car in the lot.